Trump Says Putin Not A Foe: "He's A Competitor"
President Trump refused to answer if he views Russian President Vladimir Putin as a friend or foe, instead labeling him a “competitor” on the world stage ahead of the first official one-on-one summit between the two in Helsinki next week. "I really can’t say right now. As far as I’m concerned, he’s a competitor," Trump told reporters on his way out of the White House for a multi-leg European tour that will also include confrontations meetings with NATO leaders and also his first visit to the U.K as president. In fact, Trump suggested that his July 16 meeting with the Russian leader could be the easiest of the three, saying "frankly, Putin may be the easiest of them all." 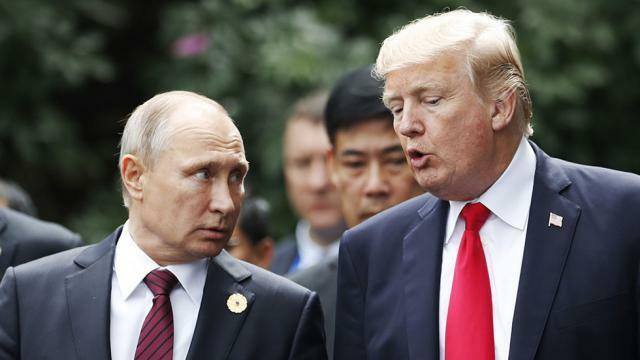 Trump then defended his efforts to improve ties with Russia despite repeated allegations that Moscow interfered in last year's elections: "I think that getting along with Russia, getting along with China, getting along with others, is a good thing, not a bad thing." Shifting topics, Trump also said that the U.K., and its embattled Prime Minister Theresa May, was in “somewhat turmoil” and according to Bloomberg "was noticeably less effusive about May than he was about Boris Johnson, who resigned Monday over opposition to May’s plans to leave the European Union." Meanwhile, after viewing Trump’s comments, Senate Democratic Leader Chuck Schumer said he feared that Trump would say "da" to whatever Putin wants. "I’m really worried about the president sitting alone in a room with Putin," Schumer said in an interview on MSNBC.